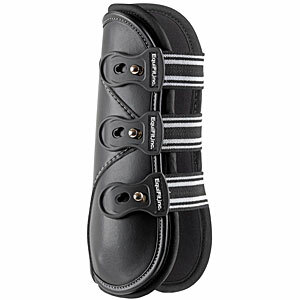 Home Horse Tack & Equipment Training & Riding Equifit D-Teq Front BootsReturn to Previous Page. 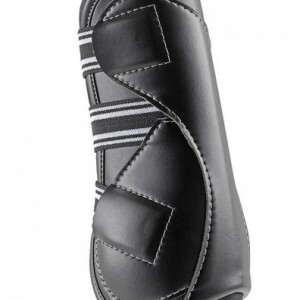 Categories: Boots & Wraps | Brands | EquiFit | Horse Tack & Equipment | Training & Riding. 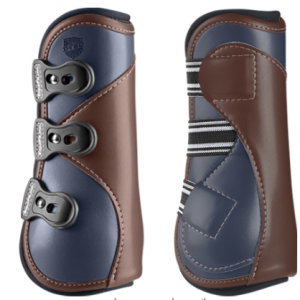 Tags: Boots | d-teq | equifit | front boots | jumping boots | open front boots. 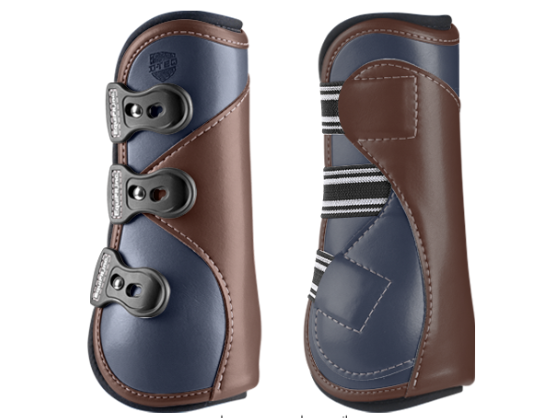 The Equifit D-Teq Boots are the latest in performance, protection, and technology from the innovators in defensive horse wear: Equifit, inc.
At Halo Horses, we understand the importance of providing the highest quality products to not only you, but to your horse. Your equine partner deserves the very best, and that is what we offer, a one stop shop for the finest products available. We take pride in our work and are here to answer any questions that you may have. 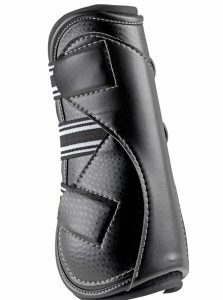 By offering products like the Equifit D-Teq Front Boots we feel that we are succeeding in providing only the best for your horse. Please visit us on Facebook and be sure to leave a message while you are there! We love to hear from you and what our customers have been up to. I love the Equifit D-Teq Front Boots for my horse. They are durable and comfortable for Jasper. (My horse). He thanks Halo Horses as much as I do for carrying such great products! I love that I can come to this site and get whatever I’m looking for, whether it be for me or Jasper. 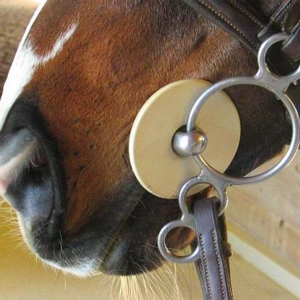 These rubber bit guards will protect the corners of your horse’s mouth by preventing the bit from pinching your partner’s mouth. 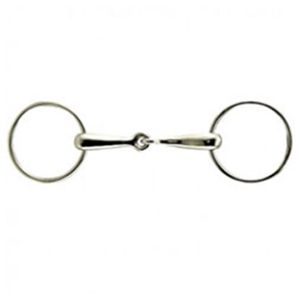 The Coronet Loose Ring Snaffle is a multi purpose bit. It’s made of high quality stainless steel. It features two 3 inch rings and an 18 mm mouth. It comes in 5 and 5 ½ inch sizes. 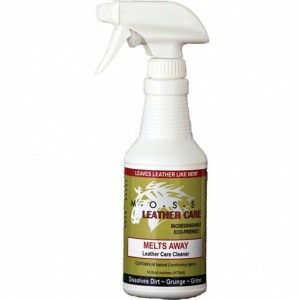 Moss Melts Away Leather Care Cleaner with Conditioners like no other leather care product. 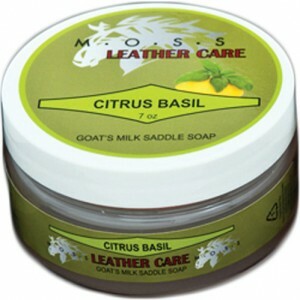 It turns the most abused leather into like-new leather after one application. 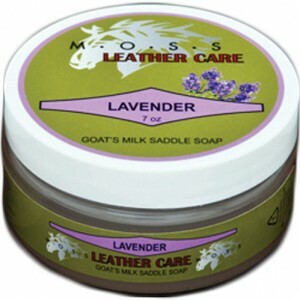 MOSS Saddle Soaps are made of the highest quality natural ingredients and proudly sold at Halo Horses LLC. 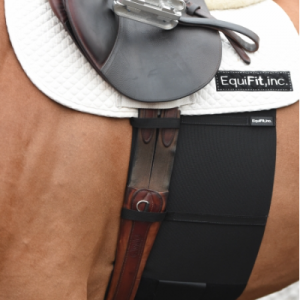 The Equifit Belly Band protects and guards against sores and spur rubs around your horse’s girth and barrel. 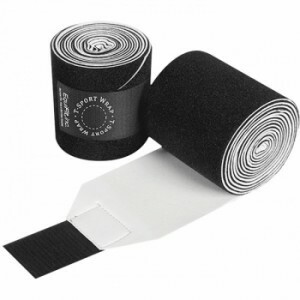 This invaluable necessity is made with breathable, non-neoprene elastic that offers full-coverage protection. 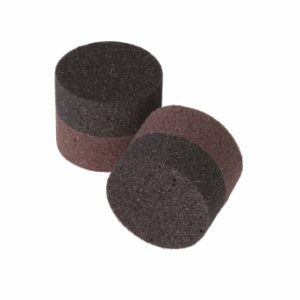 The Equifit T-Foam Earplugs have been produced using the same custom-fit technology as used in human earplugs, T-Foam Equine EarPlugs conform to the horse’s ear creating a strong seal, eliminating all noise. 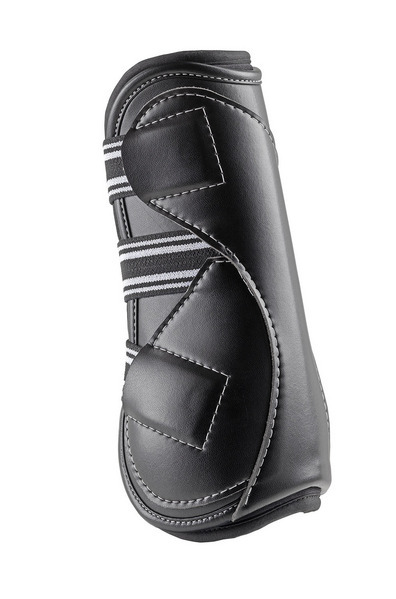 State-of-the-art T-Sport Wrap transfers heat out and keeps your horse’s legs cool while at work. 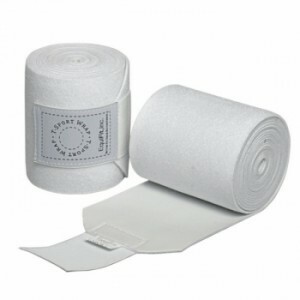 Provides maximum compression and support to soft tissue, as well as slip-free support for your at-risk horse’s legs. 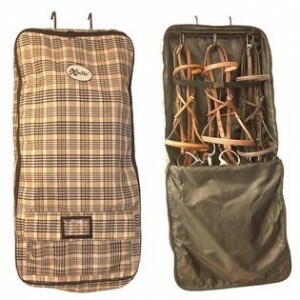 The Exselle Bridle Bag with Hooks is a well thought out bag that has front flap zipper; and opens up to a large 22″ x 17″ area for quick and easy access to a study 3 bridle hook rack. 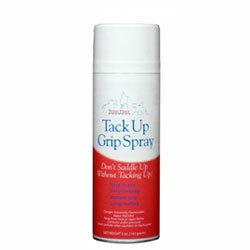 Tack Up Grip Spray is well known in the equestrian world for providing instant grip that is extremely long lasting. 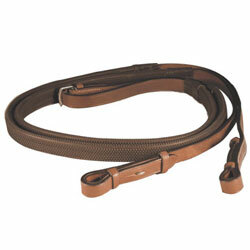 The Nunn Finer Florona Standing Martingale is crafted from beautiful and buttery soft Italian leather. It features raised fancy stitching that pairs perfectly with either the Nunn Finer Florence Bridle or Nunn Finer Verona Bridle. Comes in Cob, Horse, and Oversize. Color is a beautiful Havana brown which darkens well to match all of your tack. As any rider will tell you, the right reins will enhance the riders ability to control and command a horse. Pulling on the reins will help stop or steer a horse without losing control or harming he animal. 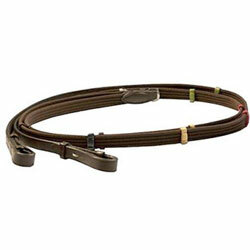 Halo Horses knows the importance of purchasing horse tack that fits the need of the rider. 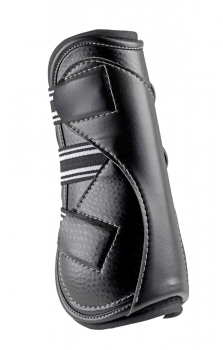 We truly believe that in order for a rider to reach their full potential, they need to proper gear. Your equipment should work for you- never against you. 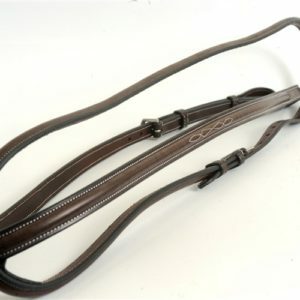 Reins are the number one link between the rider and the horse; and should always be made of high quality leather or a synthetic material that will not harm your horse. Cheaply made reins will cause chaffing to your horse, causing pain and discomfort. Halo Horses, your premier equestrian boutique is happy to be selling the Exselle Elite Web Reins in brown with colored stops.